Jonas Jakaitis was invited by Alytus Business Advisory Center as expert to project No LT-PL-1R-032 “Increase the competitiveness of the PL-LT borderline through development cooperation and clustering services”. Project is financed by European Union INTERREG V A PROJECT /„IncomClus”/ No. LT-PL-1R-032 Duration: 2017 02 01 – 2018 01 31. CLOSING CONFERENCE „INCREASE COMPETITIVENESS OF THE PL-LT BORDERLINE THROUGH DEVELOPMENT OF CLUSTERING SERVICES”. The purpose of the closing Conference (2017-12-7 – 2017-12-8) is to submit results of implemented project, to shear new ideas, views and experiences for the development of new challenges. Project team from VGTU consisting of 8 experts: doc. dr. Edita Šarkienė, doc. dr. Rasa Užpalytė - Vitkūnienė, dr. Aušrinė Gečienė, dr. Jūratė Venckauskaitė, PhD student Vytautas Palevičius, assistant Rūta Skripkienė, secretary, Airida Bernotaitė and doc. dr. Jonas Jakaitis visited Serbia from 22 to 25 may 2013. In accordance with previously agreed visit Agenda, the meetings were held at Kragujevac and Novi Sad. Three meetings were held on May 23, 2013. The first morning lectures were held at premises of Directorate of Urbanism Kragujevac in cooperation with Serbian Chamber of Engineers. EU experts Jūratė Venckauskaitė and Vytautas Palevičius had lectures on SUSTAINABLE URBAN DEVELOPMENT IN EU - EXAMPLE OF VILLNIUS/EU CAPITAL OF CULTURE `09 to municipal urban planners and representatives of municipal public service companies. Topic of their presentation was also quality management standards in urban spatial planning in Lithuania. They also presented public governmental system and territorial planning system in Lithuania that are completely harmonized with EU; the qualitative comparison of Serbian and EU systems was made. The TEMPUS ISIS (TEMPUS JP 510985-2010 Improvement of Students' Internship in Serbia) conference as the part of Quality Festival 2013 was held on May 23rd at Faculty of Engineering, University of Kragujevac. As Inter-Tempus Coaching activity representatives from VGTU participate at the conference in order to share with representatives (academic staff and students) from Serbian partner universities (Kragujevac, Nis and Novi Sad) their experience in student internship related to urban engineering study programs. Jonas Jakaitis had presentation entitled STUDENT INTERNSHIP IN URBAN ENGINEERING BACHELOR STUDY (RELATED TO EU PROJECTS) - EXAMPLE OF VGTU. Rasa Ušpalytė and Rūta Skripkienė had presentation entitled STUDENT INTRENSHIP IN URBAN ENGINEERING MASTER STUDY IN VGTU. After the conference the project quality control meeting was organised. Project coordinator Prof. D. Gordic, presented realized project activities and at the meeting it was concluded that dynamics and quality of the project are going to enable achieving the expected project outcomes. The representatives from VGTU praised the way of organisation of dissemination activities i.e. promotion of new developed study programs realised at UKG. 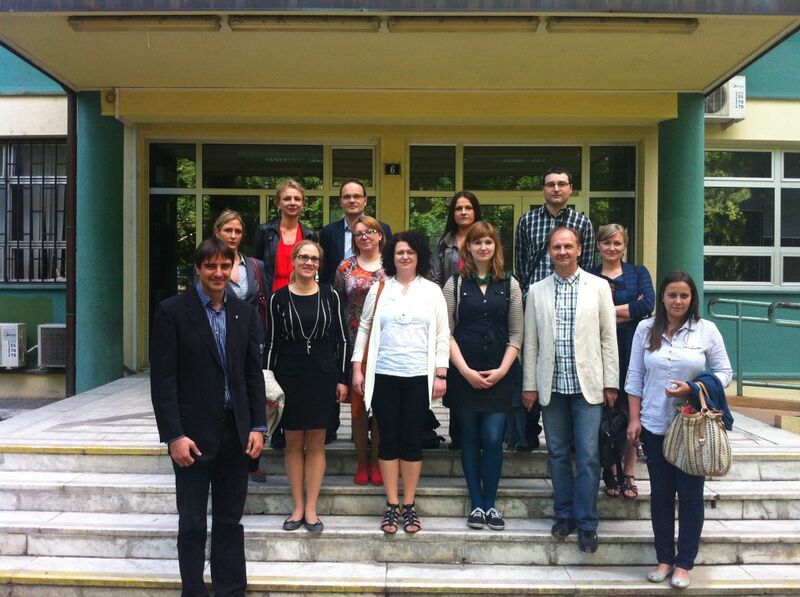 On 24 May 2013. with representatives from UKG, VGTU experts visited University of Novi Sad, Faculty of Technical Science (FTN), Department of Architecture and Urbanism. After the presentation of UNS and FTN organisation and experience in urban engineering studies, Aušrinė Griškevičiūtė-Gečienė and Edita Šarkienė had presentation URBAN ENGINEERING IN LLL EDUCATION AT VGTU on organisation of urban engineering lectures at VGTU. Beside, MNGT meeting was organised with main topic of discussion - organisation of study trip of Serbian academic partners to Vilnius in September 2013. Also, possible participation of project partners in new joint projects was analysed.